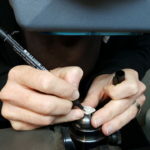 Explore and develop your ideas over three days to create a unique piece of jewellery in the supportive and relaxed environment of our workshop with Jo Dix. Suitable for all levels. This 2.5 day intensive course is highly personalised, with learners encouraged to work on individual projects with the support of their tutor, Jo Dix. Jo doesn’t prescribe what you make but assists you with your designs and new techniques to create your piece/s and increase your jewellery-making skills. The course, set in our well-equipped workshop, is informal and caters for all levels from beginner to experienced. Design functional/ aesthetic items of your own choosing with relevant techniques being demonstrated on an ongoing basis (such as forming, marking, texturing, sawing, connecting and polishing resistant materials). Advanced students can learn further techniques (for example surface finishing, patination and stone setting) to develop your individual projects and skills. Please note beadwork, enamelling and metal clays will not be covered in the course. When you have finished this course you should be capable of creating jewellery items that before the class you would never have attempted. Basic tools are provided for use at the workshop, but students are welcome to bring their own named tools or craft box if they have them. There is a rolling mill, and Jo is addicted to texture; you may wish to bring items for experimenting – lace, textured paper, skeleton leaves, paper punch cutouts (optional). Please bring your own permanent fine marker pen for marking metal. As the tutor does not prescribe what students make, participants are expected to bring any designs or part-completed projects with them for discussion/ advice. Beginners should bring ideas of what they might like to make; books and magazines are available for inspiration. Closed shoes are required in the jewellery workshop – students wearing open-toed shoes/ sandals will not be allowed to enter the workshop. Any students with long hair must bring a hair band or similar to tie hair back. Do not wear loose/ flowing clothing that may get caught in machinery. Bring safety goggles if possible – there are some available but you may find your own pair more comfortable. Tea and coffee are provided on Monday afternoon, Tues & Wed morning. Jo is happy to answer any questions you might have about the workshop and can be contacted by email jo@silverforge.co.uk or by phone on 015395 63313 (10am – 5pm Wednesday to Friday). She will attempt to contact everyone enrolled prior to the course for a discussion about what you might like to make and what may need to be ordered. Materials are not included in the course fee. The tutor will bring a selection of raw materials with her so that you can purchase what you need. Bring your own bullion if you have any. Materials cost varies depending on your design and your budget, but Jo will give you the metal prices on the day so that you can plan your work accordingly. Jo Dix is an experienced designer-maker who runs her own shop in Milnthorpe, where she specialises in commissioned pieces for clients from all around the UK. Jo works in a variety of media and has been teaching jewellery-making for 13 years.